PRTG Network Monitor is a complete wrap around provision for monitoring your entire IT infrastructure including LANS, WANs, servers, websites, apps and even mobile devices situated in remote locations. PRTG successfully monitors your whole system effectively, regardless of what sector your business is in; financial, medical, legal, e-commerce, UK based or with worldwide physical and virtual coverage, PRTG provides a fully customisable solution to ensure your business never misses a beat. PRTG network monitor can be installed for Windows® or as a hosted version. PRTG Network Monitor simplifies your daily workflow by using one simple to use and interpret dashboard on your PC, or through an app on a mobile device- giving you full access to all monitoring data around the clock, regardless of where you are. The dashboard interface graphically shows the status of all server features, devices, and applications in an ‘at a glance’ format which can also be toggled to show an individual graphical map for each item sensor. PRTG is compatible with monitoring Oracle, Amazon Web Services, Buffalo, Microsoft SQL and Exchange servers, Cisco, Bell, Hewlett Packard, IBM, NetApp, Apache and many more apps and vendors. There are three versions of the multiple user interfaces available. Ajax web interface. This provides ‘on premises’ access hosted by the makers of PRTG, this is a web interface that connects your PRTG server with a web browser. The web interface provides full configuration of devices, sensors, service administration and user management. This highly interactive, single page application uses Ajax to deliver a powerful interface that is easy to use. Enterprise console. The enterprise console is a native Windows® application to access your PRTG on premises. This arrangement has extended pop up window functionalities that provide a seamless link to the Ajax web interface- it is possible to view multiple PRTG servers through this one interface enabling the user to centrally manage PRTG on premises installations that are distributed over several locations. PRTG mobile app. This mobile app enables you to fully monitor your network while on the go, whether PRTG is on premises or hosted by Paessler, the app is available at no charge for both iOS and Android devices. The app enables the user to view and monitor data and fully configure system options. It is possible to use push notifications in combination with the app to constantly keep your eye on the performance of your network. Every server or network device will have many parameters and services that will require monitoring to ensure optimal performance. Unlimited sensors can be set up to reliably and constantly monitor every element; for example, web server response times, Global PING times, CPU load, Linksys devices and humidity levels are just a few items that will benefit your company from real time functionality monitoring. Knowing when something goes wrong with your system early, enables you to minimise the damage and downtime for your company. PRTG provides alerts to potential problems or outages via email, SMS or pager so that the issue can be addressed before it slows workforce efficiency. PRTG uses flexible alert protocols to ensure the information received is tailored to the specific needs of your operation. Alerts can be customised for each sensor monitored and be delivered as email, push notifications, as an alarm or an audio file, or even trigger HTTP requests. PRTG on premises also offers SMS messaging and executing .exe files. The system is fully adaptable to fully meet your needs as you choose how and when to be alerted and about what. Here is a quick look at just some of the highlights and available features of PRTG Network Monitor. During set up of PRTG network monitor a device list is created; each ‘device’ on the list represents a true physical ‘device’ within the IT infrastructure. This will include items such as firewalls, exchange servers, printers and laptops for example. On each device you create, or deploy one or multiple sensors, depending on your requirements. Each one of these sensors monitors one single property; this could be anything from CPU load, bandwidth usage, a paper jam, an MS Exchange™ mailbox send queue, to a failed backup. The number of sensors chosen to apply to each device will depend on the level of complexity of your business operations and how closely you wish to monitor each aspect. You may choose to apply a general ping and port monitoring sensor for a device or monitor that device more closely by adding sensors to gain performance data based on numerous parameters. There are currently over 200 sensor types available from PRTG, with new ones constantly being developed in response to meeting the needs of new product releases. The use of local and remote probes enables monitoring of several networks and separated networks within your company that are situated in different locations. These can all be overseen from just one central PRTG core installation with each PRTG license including unlimited remote probes. The information collected from each sensor is monitored by a’ probe’, the probe is a process (application) running on a Windows ™ based PC. The machine holding the initial installation of PRTG Network Monitor is referred to as a local probe. If you need to achieve multi-location monitoring you may need to install ‘remote probes’ on the other machines that are within your LAN, DMZ (Demilitarised Zone; this is the perimeter network to ensure monitoring of external facing services) or machines within global reach: as long as they can be reached by the net they can be monitored. It is necessary to add additional ‘remote probes’ to your setup to extend your monitoring to networks that are not directly reachable by your PRTG core installation or cluster. To use the remote probe facility the IPCheck probe service needs to be installed on the chosen machine, then the parameters need to be set on both the remote and main machine- if the system is deploying custom sensors it will be necessary to ensure the script files are copied to the remote probe machine. However, if PRTG can monitor through a firewall from the local probe, the addition of a remote probe on a device may not be necessary. For ease of use, the PRTG administration Tool is automatically installed on the initial PRTG server, it is also automatically installed on all other machines that have a remote probe configured. PRTG Network Monitor is also available as a fully hosted service provision. By choosing the cloud-hosted system, there is no requirement to manage the hosting or maintenance of the system. The system can be set up quickly and benefits from automatic software updates, ready to use monitoring with no stress of manual configuration, and the provision is fully scalable through flexible levels of subscription. This option works through a remote probe to the customers IT infrastructure being deployed from the PRTG server through the subscription service. The hosted version of network monitoring provides the end user with an easily managed service with the end user stress completely removed. The monitoring data is still fully accessible through the dashboard and alerts are still received by the end user in the same way as through the customer installed local Windows® service. One of the real benefits of the PRTG Network Monitor is that it saves a vast amount of time by not having to manually check all aspects of your company’s network. The dashboard or user interface provides a fully comprehensive array of visualisations of your IT infrastructure by providing ‘maps’ demonstrating full status information in real time. It is possible to create dashboards with the PRTG map designer to integrate all your network components with over 300 different mapping objects; the maps can even be individualised with custom HTML to ensure they meet the precise requirements of your organisation, not some pre-conceived idea of the software designer. The maps can be shared by providing the unique URL on the dashboard within your company LAN or, if desired, on platforms external to your organisation. The fully customisable dashboard provides a faultless user experience to view, interpret and share critical stats. The maps can be used as the primary source of information, not just as a brief overview. Geo maps provide live information from anywhere in the world, different maps can revolve through the dashboard view making everything visible in sequence to ensure you are always up to date. The maps can be edited to integrate all monitored components easily and can be created in a multilayer format that enables the user to ‘drill down’ through the layers; with the option to add external images or applets to the interface, the user can create a truly comprehensive overview of your business needs without having to swap apps or browser pages. The unique dashboard URL can be restricted to authorised users or can be shared or embedded in other webpages by using Iframe protocols. Historic data can be exported as HTML, PDF, XML or CSV formats to enable analysts to comprehensively monitor and scrutinise the IT infrastructure of your organisation. These in-depth reports are invaluable for shaping future company growth and IT investment strategies; the reports can be run on demand or scheduled daily, weekly or monthly depending on your specialised requirements. As more and more IT infrastructures are now hosted within cloud solutions, monitoring these elements is just as integral to system health as ‘on site’ provision. Back up sensors. PRTG includes sensors to monitor all these aspects. Cloud HTTP sensor. This enables checking of global cloud computing services. PRTG cloud provision in Asia, Europe and the USA provides the ability to determine worldwide response times. The Ping sensor monitors upload/ download speeds from PRTG servers covering Asia-Pacific; located in Tokyo, Western Europe; located in Ireland, Eastern USA; located in Northern Virginia and Western USA, located in Oregon. AWS- Amazon Cloud Watch monitoring is a simple solution for managing multiple Amazon accounts without needing to manually move from one account to the other. If you require more in-depth monitoring of these services, there are sensors that monitor EBS, EC2, ElastiCache, ELB, RDS, SNS and SQS to deliver an extensive insight into the IT system performance. Mail server monitoring; be alerted immediately the system goes down or when send/ receive queues build up or dysfunction. Microsoft ® OneDrive monitoring displays remaining storage levels or corrupt usability instantly. Google Analytics ™ sensor accesses the Google API to gather the most important data, unique user information and site views; all displayed on the PRTG dashboard alongside other variables you choose to correlate it with, this gives real insight into site views against IT performance variables. Reliable backing up an IT infrastructure is one of the most important aspects of protecting the integrity of business data. Back up is an important part of business intelligence; it protects sensitive customer data, helps to meet compliance requirements, and serves as operational documentation for business processes. Scheduled backups offer businesses peace of mind that all these concerns are covered, however, if the back up failed or was corrupt, this could lead to a data loss with large scale interruptions to business and possibly an irreversible breakdown of positive customer relationships. The cost to recover and replace lost data can be financially huge and, more importantly, can lose a business extensive productivity. These risks can be reduced by monitoring backups. Most businesses already implement some form of backup software, ( very often multiple applications to tape and cloud), of operating systems through to VMs. PRTG monitors unlimited amounts of back up software with the ability to apply specific filters to scan for incoming notifications of back up failure. If the back up fails, you will be alerted so there are no unfortunate surprises further down the line. Establish protection of data; eliminate being caught out by realising too late that data you need is not up to date or is missing. Automation; by automating the whole process the workload is substantially reduced, manual notifications from multiple software applications are centralised to provide a slimline experience. Select the preferred method of notification- email, SMS or push to be delivered to the preferred location or device. Automatic alerts ensure back up fail or success is immediately notified, no more remembering to manually check. Dashboard overview of backup to clearly show successful or failed status at a glance. Conform to compliance regulations. Corporate data is only truly safeguarded once you know the backup process was a total success. PRTG provides full failover tolerant monitoring. If the primary master of the ‘cluster’ is down, or not connected to the network, an alternative node will take over all responsibilities of the down machine. This includes continuing to send monitoring notifications. The failover solution also offers multiple points of presence to ensure all nodes monitor all sensors, all the time to enable comparisons in response times from different locations in the network, whether LAN, WAN or VPN. The Linksys sensors provide full monitoring of all routers, switches, cameras, Wi-Fi routers and access points to avoid overloading and to assist with optimising bandwidth. These smaller devices can easily become overlooked when maintaining or troubleshooting IT issues. With constant sensor monitoring, you can ensure that these critical pieces of hardware keep working to enable smooth workflow and full productivity. The CPU is at the heart of productivity. PRTG provide sensors to monitor servers, computers, and a multitude of other hardware. Monitoring CPU usage can provide alerts for potential overload to minimise risk to the IT infrastructure quickly. The CPU chip contains several processor cores to share the overall load which leads to stability and maintains performance. As the percentage of computing power needed for active processes increases so does the CPU load percentage, the more processor cores the CPU has, the less strain the system will be under. However, CPU requirements can increase rapidly; monitoring the usage is a fundamental consideration to optimising the performance of the critical IT infrastructure and is compatible with Windows® and Linux/Unix based systems. PRTG monitors uniform load distribution to easily identify where and when the usage load gets heavy, meaning overload can be addressed to ensure ongoing optimum performance; this enables the workflow to not become impacted by slow system speeds. Web server sensors check the availability of web servers, server performance, CPUs and memory. A website is often the main user interface for the profiling of your business; apart from the obvious visual appeal of your site, the performance elements are crucial to building and maintaining customer trust. A site that loads slowly or lacks agile performance, will quickly become a frustrating experience for visitors- this will lead to increased bounce rates as impatient users leave, this could lead to a fall in sales, or with chronic loading issues, the site could crash. The more dependent your business is on its website, the greater the consequences and costs for even just a few moments of downtime. Even with today’s ‘cloud’ based it infrastructures, there is still a requirement to have on-site hardware installations. This sensitive equipment requires special protection, not just from unauthorised server room access but in terms of humidity and temperature control. Steam and condensation can cause corrosion and electrical malfunctions if left undetected. It is most probable that without humidity monitoring, this would only become evident when a malfunction had occurred. PRTG is compatible with most brands of hygrometer sensors within and around your hardware including Jakarta, Netamo, Kinetix and Ignite. The PRTG dashboard displays an overview of current humidity thresholds and triggers an auto alert if these values become exceeded. The elements of PRTG discussed above are in no way an exhaustive list of features, but an overview of some of the most common elements of an IT infrastructure that businesses would want to monitor to enable and receive early warning of problems before they impacted business. 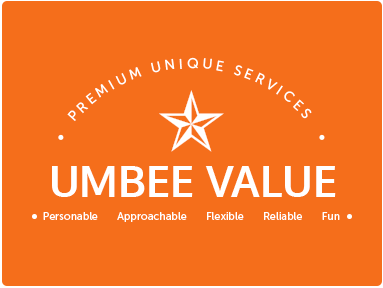 At Umbee we are experienced with setting up all aspects of network monitoring for you. Our qualified Gurus are happy to discuss your needs and advise you on the elements that would be most beneficial to your unique business sector requirements.